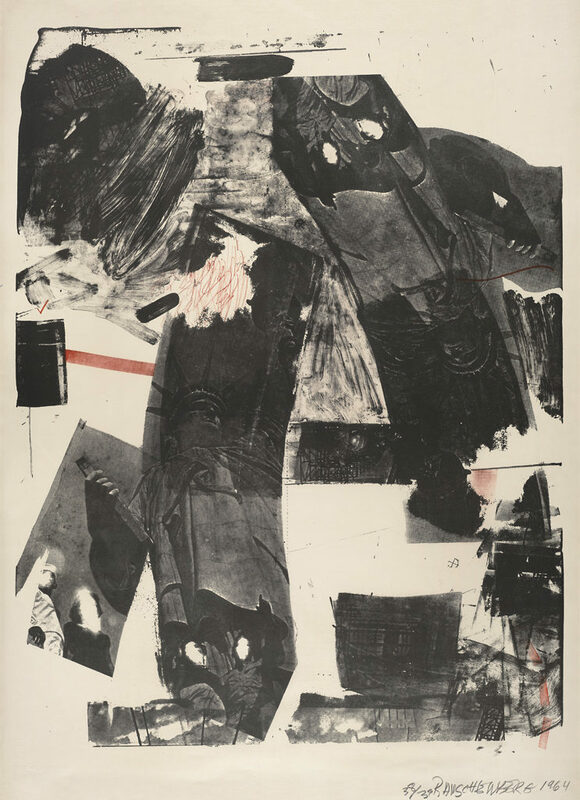 Robert Rauschenberg’s Front Roll (1964)—a poster-size print featuring several images of the Statue of Liberty—was created during a brief but remarkable period when the artist was combining photographic imagery applied via silkscreen with various lithography techniques. Two years earlier, when he was just beginning to use silkscreen images in his paintings, Rauschenberg had accepted a standing invitation from Tatyana Grosman to produce a limited edition of prints with Universal Limited Art Editions (ULAE), the printmaking studio she founded in 1957 in West Islip, Long Island. While his first efforts involved various solvent transfer techniques—including the use of lighter fluid to transfer magazine and newspaper images onto lithographic stones—his approach quickly became increasingly experimental. Front Roll, produced at ULAE in an edition of 33 in May and June of 1964, combines elements of silkscreen and lithography. 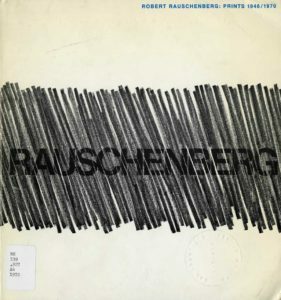 To create the work, Rauschenberg pushed lithographic tusche (a liquid used for drawing on lithography stones) through photographically produced silkscreens, and subsequently manipulated the pigment directly on the stone. Front Roll was printed from two stones, one marked in black ink and the other in red. 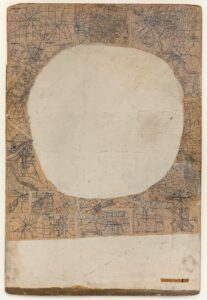 Its composition is dominated by two soaring images of the Statue of Liberty framed within bold, highly geometric swaths of ink that sweep the sheet vertically in opposite directions, one upright and the other inverted. These marks offer fractured views that bring to mind the visual effect of wiping condensation from a window to gain glimpses of the world outside. The remainder of the sheet is filled with scribbles, swirls, and bands of black and red whose arrangement reinforces the sense of spiraling movement that is the print’s defining characteristic. Sales records kept by Universal Limited Art Editions indicate that the print was purchased by “Orlofsky’s friend.” It is likely that the Orlofsky in question is art collector Myron Orlofsky (1928–1976). 8th Selection of the Society for the Encouragement of Contemporary Art, San Francisco Museum of Art, November 30–December 26, 1965. Extending the Perimeters of Twentieth-Century Photography, San Francisco Museum of Modern Art, August 2–October 6, 1985. 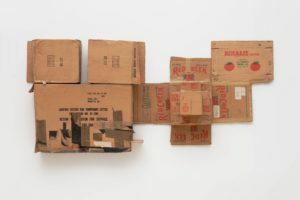 In addition to appearing in the special exhibition listed above, Front Roll was shown in SFMOMA’s galleries in 1974, 1976, 1985, and 2008 as part of a series of rotating presentations of the permanent collection. Cleve Gray, “Tatyana Grosman’s Workshop,” Art in America 53, no. 6 (December 1965–January 1966): 85 (ill.). Edward A. Foster, Robert Rauschenberg: Prints 1948/1970 (Minneapolis: Minneapolis Institute of Arts, 1970), n.p. Esther Sparks, Universal Limited Art Editions: A History and Catalogue: The First Twenty-Five Years (Chicago: Art Institute of Chicago, 1989), 226, 436 (ill.). Walter Hopps and Susan Davidson, eds., Robert Rauschenberg: A Retrospective (New York: Solomon R. Guggenheim Museum, 1997), 380. Janet Bishop, Corey Keller, and Sarah Roberts, eds., San Francisco Museum of Modern Art: 75 Years of Looking Forward (San Francisco: San Francisco Museum of Modern Art, 2009), 150.